Last year, I was shopping in Water Tower Plaza (Chicago's downtown mall) on Michigan Avenue and made my regular stop at Fossil (they know me by name there). I spoiled myself that day with a sterling silver charm bracelet and a sparkling "C" letter charm. Later that year, my boyfriend surprised me with an envelop charm to add to my bracelet because we were always sending each other letters and packages (we were long distance at the time). Since then, I haven't purchased anymore charms for my Fossil bracelet, but was curious to see if they had any new charms for the upcoming season. 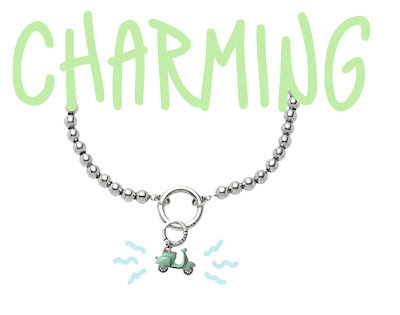 I was browsing their site a few days ago a was surprised to see new styles of bracelets and several new charms! I love these new delicate ball chain bracelets in sterling silver and rose gold. Originally, there were only two bracelet options and the charms only came in sterling silver. Now, charms and bracelets come in trendy rose gold, and elegant yellow gold, and classic silver. These charm bracelets are fun to design & personalize to give as gifts to your favorite friends & family members! I could spend hours on Fossil's site designing a bracelet for every occasion. Give it a try for yourself on their online Charm Builder! Those are adorable! Not that I need another charm addiction (I have a Pandora and bought Mom a Brighton that I add too). I may have to look closer though!